Figuring out how much you can budget toward exterior cladding is the first step in determining vinyl siding installation costs. These three insights can further help you determine why vinyl siding prices vary greatly and provide some pointers for negotiating a fair price with contractors. The cladding itself. Vinyl is sold in several different grades from economy to premium, the latter being the thickest, most durable on the market. Keep in mind that while the low-price product may save you money up front, if you live in a region with harsh climate changes, that cladding could see a short length of days. Many contractors mark up materials, which is a long-accepted practice in the construction industry. By researching costs through local suppliers, you may be able to negotiate lower pricing. Experience. Vinyl siding contractors who have been in the remodeling business for decades usually charge a premium for their experience -- and rightfully so. They are trusted to correctly weatherproof your home during installation and to stay in business in subsequent years to answer any service calls. That trust typically comes with a high price point. Other contractors may be willing to fudge on the bottom line to win work. If you find a contractor you like, but his bid is too high, see if he's willing to move numbers to win your job. With the downturn in residential construction, contractors may be more likely to sacrifice profit than walk away from work. Accessories. 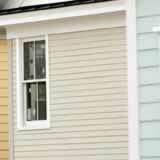 Vinyl siding requires a whole slate of accessories, such as trim, corner and starter pieces. Some homes also need new soffits and fascia. Instead of facing open-ended costs for accessories, have your contractor measure how many linear feet of these materials are needed to do the job and provide a fixed price -- this is a good way to avoid expensive cost overruns. Like vinyl siding, not all installation contractors are the same. You may notice these facts as you solicit bids for a job. Let these insights help you get the fairest price for the finest work on your home.